Located in a breathtaking mountain canyon 200 miles west of Boulder, Rifle Mountain Park has some of the most legendary sport climbingopportunities in North America. With over 400 climbs to choose from, climbers of any skillset are sure to find a route that appeals to them. Expert to super elite climbers will find climbing in Rifle Mountain Park especially promising, as this area offers some of the highest-quality and most diverse 5.13 rock climbingin the world. What Does Climbing in Rifle Look Like? Rifle Mountain Park offers an enormous variation of limestone walls and caverns, some with slight overhangs and others with extreme overhangs. Climbers will enjoy plenty of pockets, crimps, pinches, and flat holds. For expert to super elite climbers, Rifle features an abundance of 5.13 and 5.14 sport climbing routes, most of which are naturally formed. Novice and mid-level climbers will find a few moderate routes, but the most plentiful are routes with climbing gradesbetween 5.9 and 5.12. What's the Best Time of Year to Climb? Climbing in Rifle Mountain Park is best done in the summer and fall. Wintertime provides scattered ice climbing opportunities, but the routes vary in difficulty depending on conditions. When conditions are favorable, the park's natural ice formations are some of the most accessible in the state. Spring is perhaps the worst time for sport climbing, as water seeps through the rocks and makes the limestone more treacherous. Whether you're planning an afternoon adventure or an entire weekend of climbing, Rifle Mountain Park is an excellent place to test your skills. So, what are you waiting for? Plan your Colorado rock climbing trip to Rifle Mountain Park today and enjoy some of the best and most accessible sport climbing routes in the US! 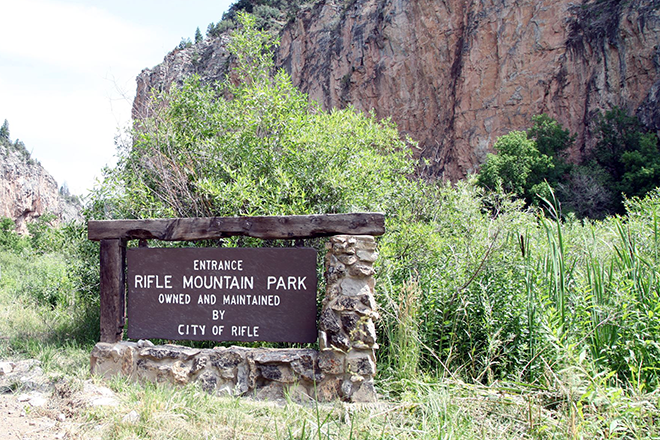 Entrance to Rifle Mountain Park. Courtesy City of Rifle.